At this cheery, kitschy East Side family spot, sandwiches, salads and burgers merely set you up for the main course: dessert. The trademarked Frrrozen Hot Chocolate—a brain-freezing chocolate slushie—deserves its reputation; the massive beast should be shared. Given the size of the Coward’s Portion of the Outrageous Banana Split, we’re guessing the full-size version comes in a trough. 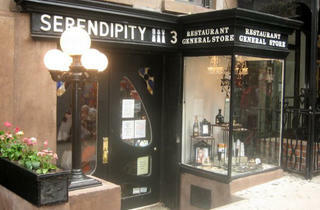 I was quite disappointed with Serendipity, after reading good reviews and it being famous for the frozen hot chocolate. We had lunch, a BLT which my boyfriend had to assemble himself, which was very strange and a ham and cheese omelette that wasn't bad. We were told that the frozen hot chocolate was unlike anything we had every tasted, erm it was just like a chocolate frapuccino in a glass with a shed load of whipped cream on the top. We got seated upstairs pretty quickly for a walk in, but I wonder how long we would have had to wait if we wanted to sit downstairs, which seems the only place people really want to sit. 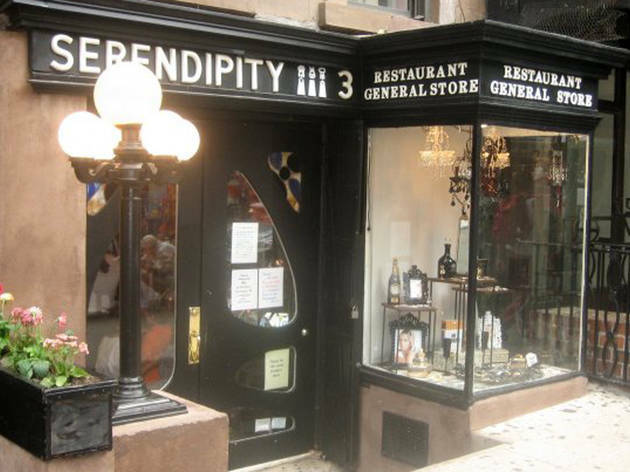 Serendipity is a bit of a tourist trap, but it's worth it to go just one time for the frozen hot chocolate. The glasses they serve them in are the size of someone's head. But be prepared to wait a while or come at an off-peak hour, and try to come with a smaller group since the restaurant is so tiny. Prepare to wait a loooong time for a table. I don’t know if it’s just me, but I always end up waiting more than 45mins for a table. It is, however, worth the wait. This small, cozy restaurant offers the best desserts in town. Their Frozen Hot Chocolate is to die for, but their brownie sundae is just amazing as well! If you love desserts, this is your go-to place for sure!